Extended Expansion Linkage Engine also known as EXlink engine powers Honda's third-generation cogeneration units. Honda claims that new units are more than 15 percent more efficient than conventional cogeneration units. Here are some explanation I took from Honda EXlink web page. EXlink engines highly efficient because in principle, the higher the expansion ratio, the higher the engine's efficiency. This is because the further the piston can be pushed towards atmospheric pressure by the high-temperature and -pressure gas created in the engine through combustion, the more work it does. With a conventional engine, common perception is that engines with a higher compression ratio are more fuel efficient. Simply raising the compression ratio to improve efficiency, however, is known to cause problems such a knocking, and may even damage the engine. With EXlink, the multi-link mechanism allows the stroke volume for expansion to be larger than that for compression. In other words, the expansion ratio is larger than the compression ratio. 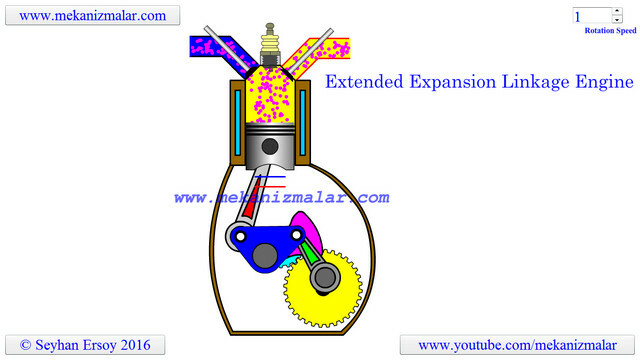 The compression ratio is 12.2 to 1, enough to avoid knocking, while the expansion ratio is raised to 17.6 to 1. By efficiently compressing less fuel and air, and expanding the combusted gas to a larger volume, the fuel's maximum amount of energy can be used. Since the intake stroke is short, pumping losses during air and fuel intake can be reduced, and thermal efficiency can be improved over conventional engines. Even though it is plain from the animation how the EXlink engine works, let.s briefly describe EXlink basic structure. With EXlink, a trigonal link is positioned between the connecting rod and crankshaft found in a conventional engine. The trigonal link is connected via a swing rods to an eccentric shaft to complete the extended expansion linkage structure. The eccentric shaft turns at half the speed of the crankshaft, allowing the piston's stroke to lengthen and shorten per cycle. EXlink realizes a high expansion ratio, expanding 110cm3 intake to 163cm3 exhaust, by shortening its stroke for intake and compression, lengthening the stroke for expansion and exhaust. The Atkinson cycle principle of .less fuel, more work. is realized in a simple and compact structure. Notice in the animation that bottom dead center of the power cycle shown with red line is longer than bottom dead center of the compression cycle shown with blue line. Notice also that while circular bubble show flow direction, background color shows engine cycle change. Blue indicates intake stroke, transition from blue to red indicates compression stroke which ends with spark plug ignition. The red the yellow transition show expansion stroke and finally yellow shows exhaust stroke.